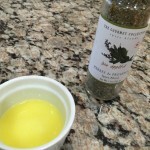 I rarely have an epic failure while in the kitchen, but a few weeks back – I was terribly disappointed with a rather large cut of meat I was cooking while following instructions, rather than going with my heart… and it really ticked me off! 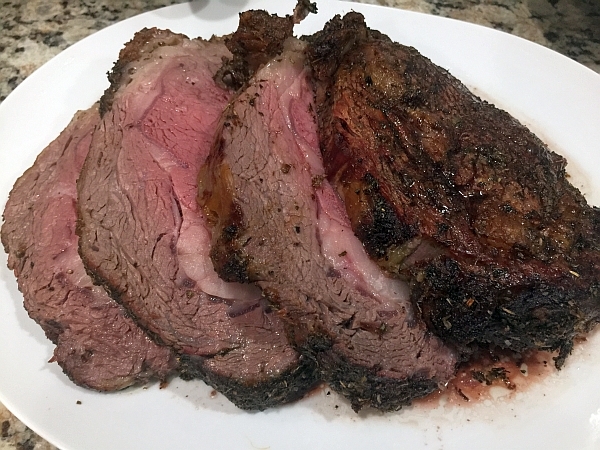 No, it wasn’t a prime rib roast, but it was almost as expensive – but I won’t bore you with the details! It was especially embarrassing because we were hosting a dinner with some friends, whom happens to be an awesome cook! 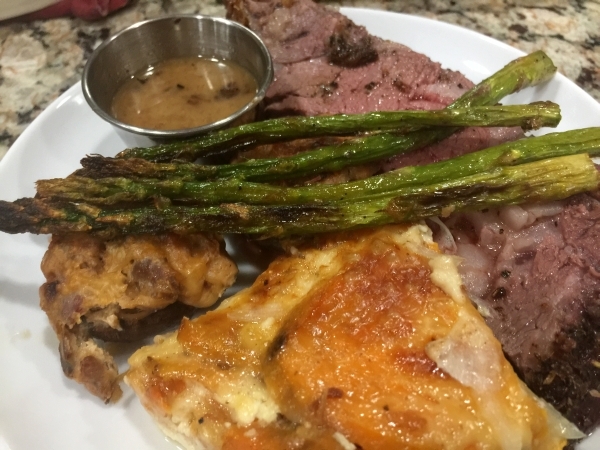 I was trying something new on my smoker and I should have just gone with my gut… Our guests claimed it wasn’t that bad, but I think they were just being nice. I assured them that I will redeem myself soon when I host them again. I have to let mishaps like that go because I know I haven’t presented Bill with too many unappetizing meals, but it had been bugging me and I really wanted to out do myself (for my pride if for no other reason) and decided to serve a prime rib last weekend for another meal that I was hosting. I will say it turned out phenomenal and I glowed with my friend Carries review: “Thanks again for having us over last night. That really was one of the best dinners we’ve had in a long time. You’re a great chef!” … Ok, I feel better now! Keep in mind when preparing a meal like this – it’s a treat. 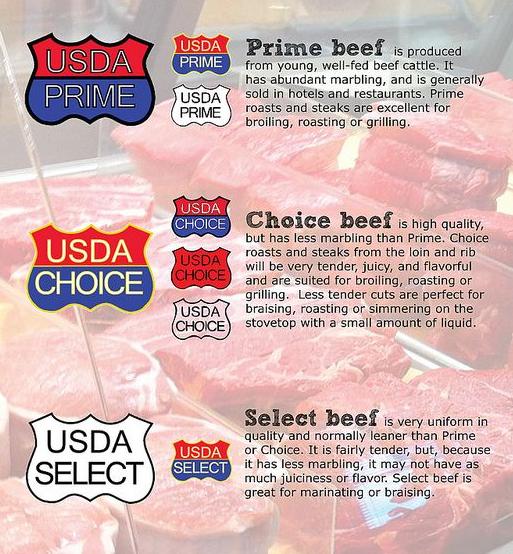 USDA prime cuts of meat are typically very expensive. 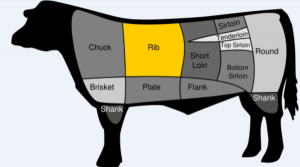 Prime rib is one of these cuts, so you don’t want to mess it up! 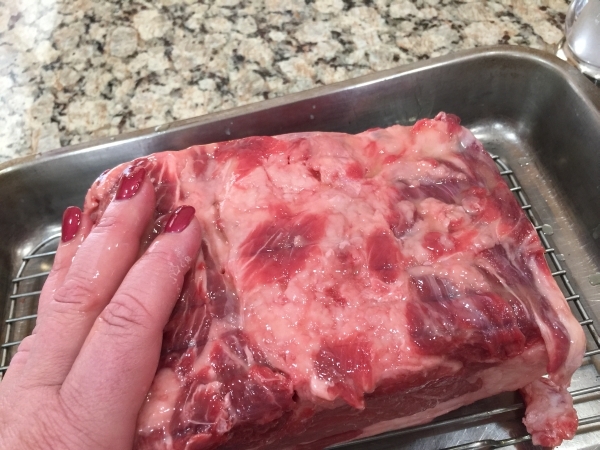 When choosing a rib roast, look for a prime cut that is the size you want and that has the most marbling. (bone in or out is your choice). I found a nice eight pound roast that I cut in half. Perfect to serve four and saved the other half for another special day. 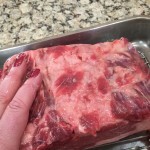 If cooking a bone-in roast, it doesn’t need a rack, since the bones serve this function. But if you choose the boned roast like I did, it benefits from being cooked on a rack. 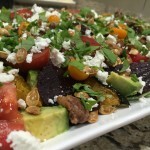 This preparation is really quite simple and has only a couple of ingredients that most people have on hand. Just don’t over cook it!! Bring roast to room temperature, about 4 hours. 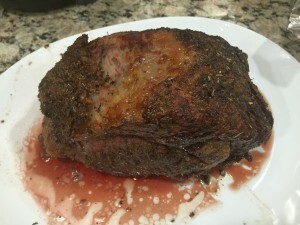 Ribeye roast is another name for Prime Rib. It is a cut from the back of the upper rib section of the steer. Preheat an oven to 500 degrees. Prime grade is almost never found in supermarkets; but you will find it at Costco and some high end stores. 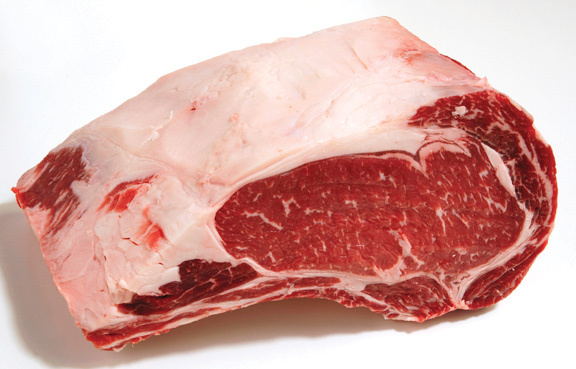 This beef is produced from young, well-fed beef cattle. It has abundant marbling and is generally sold in restaurants and hotels. Prime roasts and steaks are excellent for dry-heat cooking (broiling, roasting, or grilling). Choice grade is still of high quality, but has less marbling than Prime. Choice roasts and steaks from the loin and rib. They are very tender, juicy, and flavorful. They also do well with dry-heat cooking. Many of the less tender cuts, such as those from the rump, round, and blade chuck, can also be cooked with dry heat if not overcooked. Such cuts will be most tender if “braised” — roasted, or simmered with a small amount of liquid in a tightly covered pan. Ok, back to the roast! Melt the butter and rub the entire outside of the roast. Turning the roast from side to side, cover with pepper, herbes de Provence and season the entire roast generously with kosher salt. 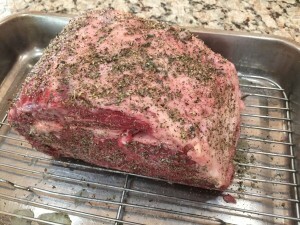 Roast the prime rib, fat side up, uncovered on a rack in the preheated oven for 20 minutes. 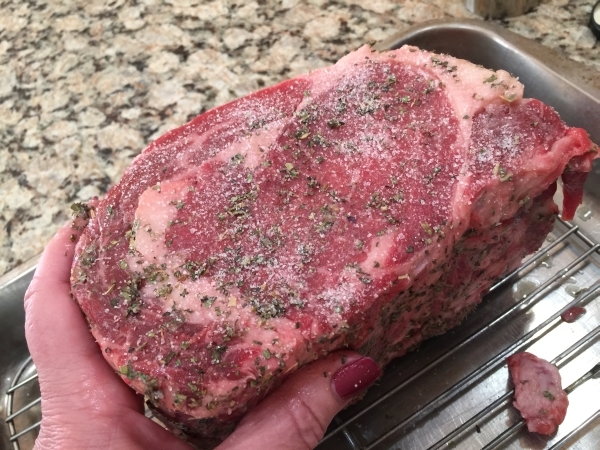 Reduce heat to 350 and continue to roast for about an hour or until the meat thermometer inserted into the middle of the roast reads 130 degrees for rare doneness and 140 for medium-rare. I recommend that you remove the roast slightly before desired degree of doneness is achieved as the roast will continue to rise in temperature several degrees after removing from the oven. Place the roast on a platter or carving board and cover it loosely with foil and allow let rest. (Do not cut into the roast for at least 20 or more minutes or all juices in the meat will flow out). While the roast is resting prepare the au jus. Drain some of the fat, leaving about a cup of the juices from the roast. Place the roasting pan on top of the stove over medium high heat. Add in the wine and cook, whisking for about eight to ten minutes, stirring and scraping any brown bits. Add in the cream and lower the heat to a simmer. Cook and reduce the juice by half (takes about 20 minutes). 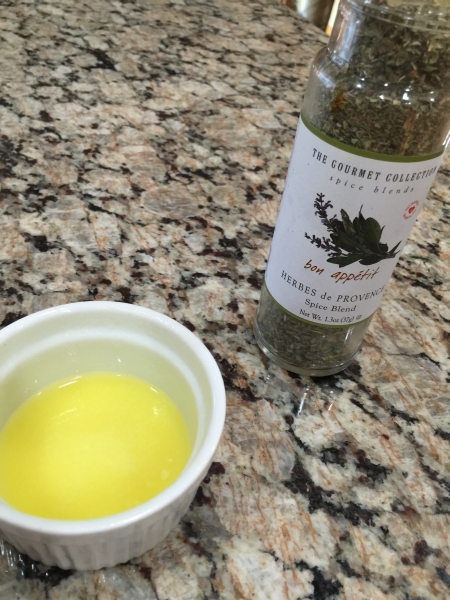 Sometimes beef drippings can be really salty so add the salt only after tasting it. Season with salt and pepper to taste. 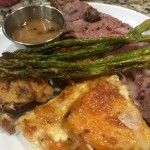 We enjoyed this roast with sides of Sweet Potato Au Gratin, stuffed mushrooms and asparagus. 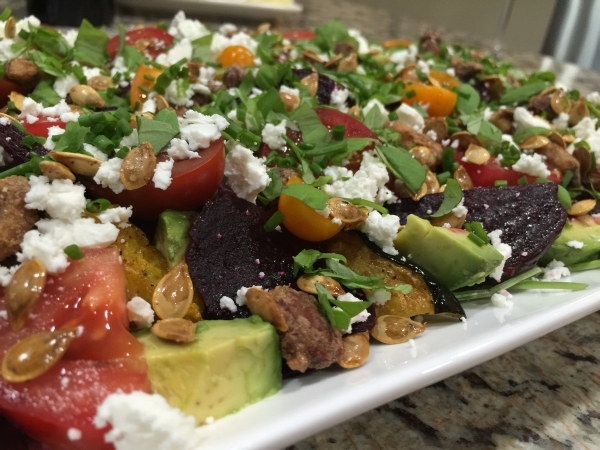 I also did a seasonal roasted beet salad, which included some tomatoes, avocado and roasted acorn squash. Super fresh! 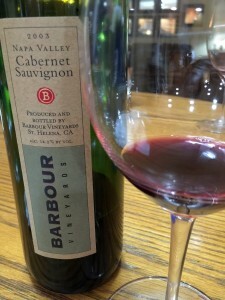 Our guests James and Carrie, brought a beautiful Cabernet Sauvignon wine to pair our dinner with by Barbour Vineyards. Delicious!